Before embarking on a discussion about the types of lures suitable for estuarine spinning and how to use them, I’d like to briefly discuss lure size. Over the past twenty years I’ve used lures of various sizes in my favourite estuary and meticulously recorded success. Based on an analysis of the results, I discovered that to catch the most diverse range of species the optimum lure size is 5 – 7.5 centimetres (2” – 3”). When I tell people this they generally do not believe me, even if I am walking off the flats carrying a 2 – 3 kilogram fish and still have the successful lure attached to the rod. To further illustrate this, the 72 centimetre kingfish in the photograph below took a 6 centimetre soft plastic. I’ve always wondered why small lures work so well and recently decided to try and find a scientific explanation for what I’d observed. By now, you are probably getting an idea of how my mind works namely that I’m not interested in developing theories that cannot be explained scientifically. During my investigation I discovered an article in the journal Marine and Freshwater Research, 2011, 62, 1327 – 1341 entitled “Predicting patterns of richness, occurrence and abundance of small fish in New Zealand estuaries”. This article was written by M.P. Francis, M.A. Morrison et al. It is a fascinating read for those interested in fishing in estuaries. The researchers surveyed 69 of New Zealand’s 443 estuaries using 9 millimetre mesh beach seine nets to determine the species composition of small fish and predict their richness, occurrence and abundance. What they essentially found was that roughly 55% of the fish species collected were smaller than 7.5 centimetres (i.e. smelt, anchovy, goby and triplefin) and that yellow eyed mullet comprised 35% of the remaining species collected. Stated another way, 90% of the small fish present are either less than 7.5 centimetres or yellow eyed mullet. Bingo! This explains nicely why lures sized between 5 – 7.5 centimetres are so successful. In short, they are an accurate representation of the bulk of the forage species present in most estuaries and this explains why they are taken by predators without hesitation. Joining the dots further, the large amount of yellow eyed mullet present also gives a clue as to what any larger fish present must prey on, aside from juvenile kahawai. Based on this data, I’ll be consolidating my small lure collection further and adding a few larger lures to my tackle box, just so that I’ve got something available should kingfish suddenly appear and start harassing yellow eyed mullet basking in the margins. It is my belief that all lures will catch fish. 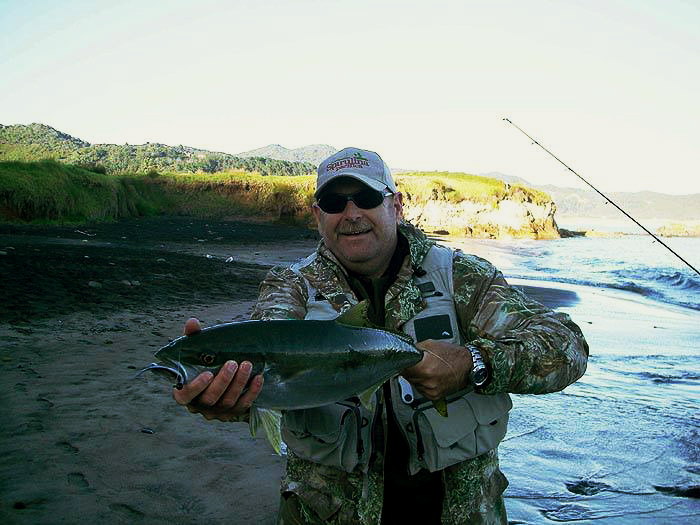 Every lure is different and has an optimum retrieve, a “sweet spot” if you like. The problem is that fishermen do not have enough time available to find this “sweet spot” and learn how to get the best out of each lure they purchase. 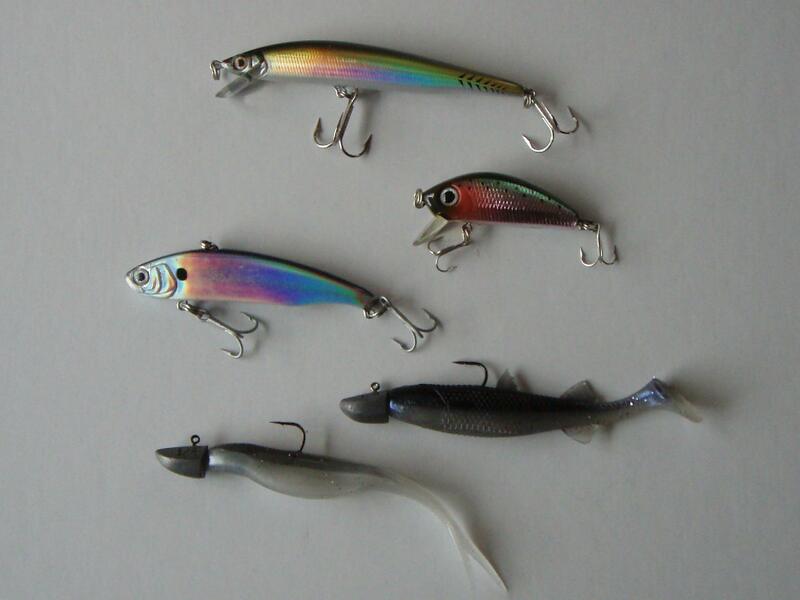 Lures are generally tied on, retrieved in a manner characteristic to the angler and the results dictate whether they become a favourite or a discard. Lure fishing is all about confidence. It starts when you select the lure in the tackle shop. The lure looks like a fish catcher so you buy it. It actually is a fish catcher you just need to find out how to make it work its magic. If you find a lure that works then it gets used over again and continued success makes it a favourite. Occasionally the favoured lure fails and then new lures are purchased in the quest to find a group of lures that will consistently guarantee success. Sound familiar? The key to being a successful lure fisherman is to limit the number of lure types you have and learn how to work these lures optimally in order to realise their potential. Vary retrieve speed, insert pauses in the retrieve, fish the lures at different angles to the current and “rip” them with the rod tip until you find out which sorts of retrieves work best for each lure and are favoured by certain species. Record what you find for reference. This experimentation builds angling skill and knowledge over time which helps when the fishing gets difficult. Having said this, sometimes if you are not catching fish on a lure using a retrieve which has worked in the past it is often worth changing up (or down) the retrieve speed. I have lost count of the times that I’ve done this and suddenly started catching fish. Kahawai, in particular, seem to be susceptible to a change up in speed. So how do you work out what is the best retrieve speed for a hard bodied lure? The first thing I do when trialling a new hard bodied lure is to cast and retrieve it at different speeds, all the time watching the rod tip. As a general rule, the optimal retrieve speed is the one which makes the rod tip vibrate (or nod) most violently. Standardising your retrieve on where the rod tip nods the most is a great place to start. It is also important to try and get the cadence (pattern of lure vibration) similar to what you would expect from an injured or distressed baitfish. My father used to say “you have to imagine that the lure is a little fish and that you are that little fish at the end of the line. You have to make the lure move like a little fish would”. If you watch baitfish their behaviour is often characterised by long periods of steady rhythmic movement interspersed with erratic flashy bursts of activity. Try to mirror this in your retrieves. Next I’ll discuss the actual lures that I use and how I retrieve them.